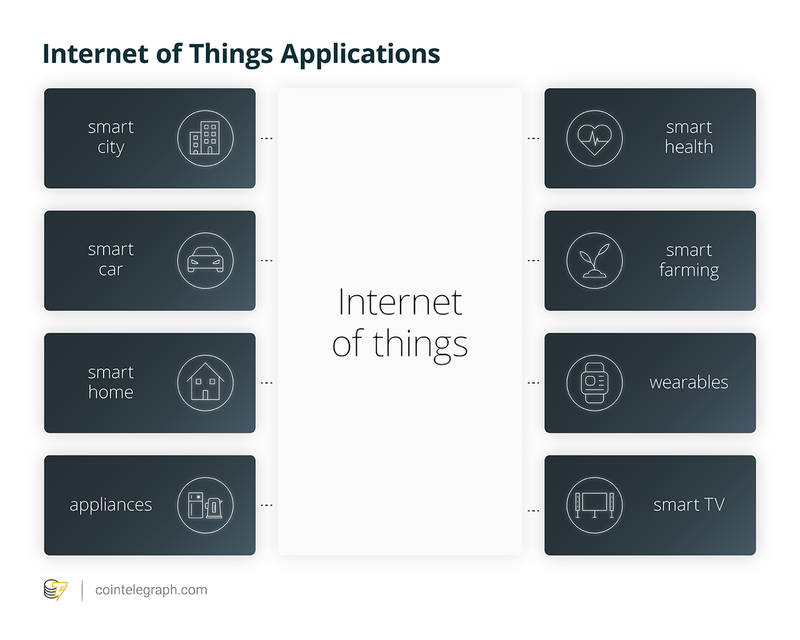 Analysts have been anticipating the implications of the Internet of Things (IoT) for several years. However, there have been two main impediments to its success: capacity and security. But now, the introduction of a new technology could change that. This year, major carriers like AT&T and Verizon will be introducing 5G, the latest generation of cellular mobile communications. The 5G platform brings a high data rate, reduced latency, energy savings, cost reduction, higher system capacity and massive device connectivity, according to analysts. The combination of 5G and blockchain technology has the potential to unleash a surge of economic value. In order to understand this connection between 5G and blockchain, one must think of the relationship as multifold. The power of 5G coverage through its reduced latency, high speeds and capacity allows for IoT devices to become widely used. Simultaneously, these devices can leverage the security, decentralization, immutability and consensus arbitration of blockchains as foundational layers. That means smart cities, driverless vehicles, smart homes and other sensor-driven enhancements will finally have a technology that can handle their needs. As foundational layers, blockchains can provide consensus and security while the majority of IoT transactions and contracts occur on second-layer networks, with the opportunity to settle payment channels and transaction disputes on-chain. The network capacity of IoT, however, will be enabled by the power of 5G coverage. Furthermore, 5G will directly assist blockchains by increasing node participation and decentralization, as well as allowing for shorter block times, driving forward on-chain scalability — all of which, in turn, further supports the IoT economy. Here is a first look at how 5G is rolling out and when real usage might be seen. Network providers have started rolling out 5G within select United States cities, while global coverage is expected to come online in 2020. Verizon will start delivering its coverage in Chicago and Minneapolis from April 11, with services moving to 30 cities throughout the remainder of 2019. On the vendor side, Samsung is expected to release its 5G-compatible Galaxy S10 model next month. Other companies, such as Huawei and LG, have announced models of their own that are expected soon. In terms of modems, we are still waiting to see one that supports both 5G and LTE. Qualcomm is expected to release such a product, the X55, in either Q3 or Q4 of this year. Apple consumers will have to hold off until 2020 before seeing a 5G-compatible iPhone, though, with the company apparently still evaluating market conditions. The benefits of 5G are its high speeds, capacity, low latency and ability to connect with vast numbers of devices. Latency refers to the time between when a signal is sent and received. In blockchain terms, latency is the time between a transaction being broadcast and it being received by nodes. However, for IoT, whether it be applied to smart homes or autonomous vehicles, achieving low latency is critical if devices are going to communicate with each other without experiencing long lag times. This reduction could unlock another concept, the Internet of Skills (IoS). This is the process by which specialists conduct their work remotely through virtual reality headsets. For instance, a dentist would be able to perform procedures remotely. If latency cannot be minimized, then the specialist will not be responsive enough, endangering the patient and undermining the entire function. It is these new applications that are driving the projections for the economic impact of 5G. A study from Qualcomm showed that 5G could lead to $12.3 trillion in additional global GDP by 2035. Importantly, 5G — with speeds of up to 10 gigabits per second — is an improvement to current home broadband services, as well as cellular networks. To put this in perspective, the average global, nonmobile internet speed stands at just 7.2 megabits per second. As such, 5G could well become the de facto internet network worldwide. The effects of 5G on IoT and related concepts are going to be further augmented by multi-access edge computing. This is a form of networking whereby service is disseminated from centralized nodes to peripheral ones, resulting in an even greater increase to speeds while also reducing latency. IoT will rely on this capacity and ability for tremendous numbers of devices to connect with each other. It has been estimated that there could be as many as 100 billion IoT connections by 2025, according to research from Huawei, with growth likely turning exponential after that. When talking about automation, it is typical to think in terms of robots replacing paid jobs currently done by humans. However, in reality, the scope of automation may eventually be far broader than this, including the replacement of chores and unpaid mundane tasks. This can already be seen in the advent of smart homes, with domestic appliances communicating with each other, keeping stock levels and managing inventory. Autonomous cars and trucks are already moving past testing, with legislation being the main impediment. Within the next decade, traditional industries — such as agriculture, mining and drilling — all anticipate automation through high-speed IoT, powered by billions of sensors and devices communicating over 5G. These applications are dependent on extensive 5G coverage to provide the capacity, speeds, and latency required for these systems to perform as intended at a global scale. But two other potential roadblocks toward 5G could present themselves. First, malicious devices could cause chaos within networks, empowered by their interconnectivity. Second, the 5G rollout will encompass an explosion in transactions and payments between these devices. Such volumes will likely dwarf the current capacity of centralized and decentralized financial infrastructure. Blockchain innovations could likely solve the first problem. Public, decentralized blockchains are proficient at ensuring immutability, tamper-resistance and establishing consensus among distrusting entities. Thus, they can be used as a foundational layer for settling disputes between IoT devices that cannot settle transactions or smart contract conditions. Since these devices can transact with money and operate vehicles, establishing an underlying protocol layer with robust security is paramount. Blockchains can excel at this. Decentralized blockchains offer further benefits over the current client-server model used in IoT. Their decentralized architecture means that identity can be protected and guaranteed. Currently, IoT devices identify themselves via cloud servers, with their identification data held in these databases. As such, the data can be compromised, stolen or imitated, presenting a major security threat to any application that runs atop such a network. By using a decentralized blockchain, we can protect these identities through the use of asymmetric cryptography and secure hashing algorithms. Devices would be registered according to their own corresponding blockchain addresses, guaranteeing their identity. This blockchain layer can provide a level of security and frictionless identification unmatched by the existing centralized infrastructure. Unfortunately, the second problem of scale cannot be directly solved by blockchains. The sheer extent of IoT means that decentralized blockchain architectures are not capable of handling the necessary throughput. This is at least true on layer one — i.e., blockchains themselves. It is both possible and preferable to defer the majority of transactions to layer two protocols like the Lighting Network that operate on top of blockchains, through the use of payment channels or sidechains. However, given that every device will need to have its own address and on-chain transactions, there will need to be an on-chain capacity that reaches tens of thousands of transactions per second. In short, scalability must improve significantly on both layers. Blockchains such as Bitcoin Cash ABC, with block size increases, and Ethereum, through sharding,are building out far greater on-chain capacity. Simultaneously, we are seeing the steady progress of the Lightning Network as it rolls out, along with sidechains such as Liquid from Blockstream, while Ethereum’s Plasma network continues to advance. The buildout of 5G and layer two blockchain infrastructure are fortuitously occurring simultaneously, providing the necessary scalability and coverage for an IoT-oriented economy. One other route for system architects would be to add other structures, such as graphs between the base blockchain layer and IoT devices. Designs such as directed acyclic graphs (DAGs) can be used to achieve far higher throughput. However, this typically results in undermined security and decentralization. Navigating the trilemma of scalability, security and decentralization is a prerequisite to any blockchain-based IoT network, and deficiencies in any of these three areas could be cataclysmic for users and would undermine the purpose of using such a protocol in the first place. Until developers can produce alternative designs that achieve high throughput without sacrificing security or decentralization, IoT networks will have to use the more limited, yet secure blockchain structure. 5G empowered IoT devices are set to drive a massive increase in data transfer. Cisco projects that they will generate 847 zettabytes by 2021. Although blockchains at their core are distributed data storage systems, it is unfeasible to store significant amounts of data on-chain. If this IoT data is not stored on-chain, though, this still leaves it open to attacks. However, it is quite possible to store hashes of data on-chain, with links pointing out to external data storage sites for the whole dataset. Indeed, such external storage could be run on other decentralized protocols, such as the InterPlanetary File System (IPFS) or OrbitDB. While this does not guarantee the same level of tamper-resistance, it does offer a stronger level of security than centralized alternatives. Importantly, by storing hashes on-chain, any tampering of the data will result in a change in the hash, thus drawing attention to such an attack, along with a time record via the timestamp. Blockchains can also directly benefit from 5G in terms of functionality and performance. One such example is smart contracting. Blockchain smart contracts often depend on oracles. These oracles relay external data to the contract. Of course, this information can only be transmitted with internet access. For applications such as supply chains, 5G can facilitate these oracles in remote areas where they otherwise would not be possible. Blockchains can also derive network improvements from 5G. The massive increases in range and bandwidth, in parallel with the reductions in latency aided by edge computing, could lead to a surge in additional nodes joining public blockchains. By extending coverage to remote areas as well as providing increased connectivity to nonstatic devices such as mobiles and tablets, there could be significant increases in network participation and, with that, improved security and decentralization. In addition, due to latency reductions, developers would have more scope to experiment with reductions in block times, thus increasing on-chain throughput. In turn, this would offer far better support for IoT devices using blockchains for settlement, consensus and security. To truly appreciate the values of 5G, IoT and blockchain, you have to consider them as synergistic rather than offering wholly separate value propositions. With the right architecture, this technology stack — along with second layer solutions, edge computing, virtual reality, augmented reality and IoS — is set to create an unprecedented amount of value while simultaneously radically altering working conditions, employment and recreation.